The Orleans Parish Sheriff's Office recently conducted a hurricane evacuation drill to determine OPSO's readiness to evacuate the Orleans Justice Center in the event of a hurricane. 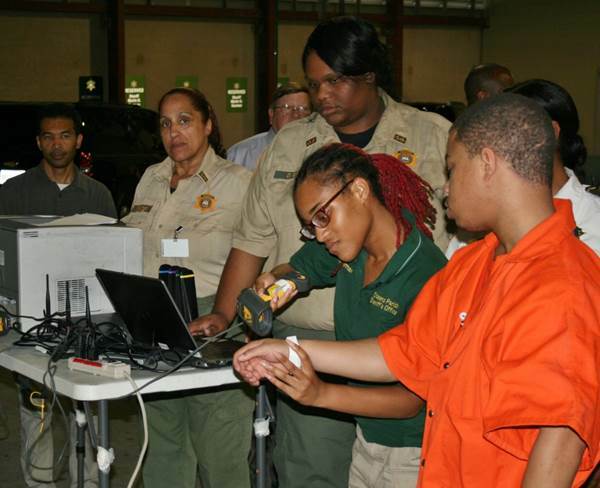 A workstation was set up in the jail facility's sallyport where security and information technology teams scanned the armbands of inmates to simulate what would happen to properly transport them to another secure correctional center. The team also simulated checking inmates back into OJC after a storm emergency has passed. As the height of the hurricane season approaches, Sheriff Marlin N. Gusman urges everyone to be storm ready, by coming up with a personal plan in the event of a hurricane. Determine if you have enough water, food, money and medicines to ride out a storm. Sheriff Gusman is urging you to also plan where you might go if you are ordered to evacuate. In case of a storm emergency, Sheriff's Office employees can get the latest news and information by calling the employee hotline 504-827-8550. Hurricane season ends Nov. 30.